There was an unusual conference in Lansing last Friday and Saturday. It was the Stewardship Network’s “The Art and Science of Habitat Restoration”. Dedicated nature enthusiasts from all over Michigan convened to learn more about restoring native habitats. Michigan is very fortunate to have numerous unusual habitats. From lakes and forests, swamps and marshes, bog and fens, to prairies and sand barrens. Along with the habitats are some rare plants and animals. We have plants in Michigan that are found nowhere else on earth. So it’s no wonder that we have alot of dedicated people who are ready and willing to do the often back breaking labor of restoring habitats that have been damaged. We’ve lost huge amounts of native habitats to sprawling development. But we also lose unusual habits to changes in drainage patterns, roads being cut through natural lands, ORV use in delicate ecosystems, damming up rivers or straightening rivers. We even lose habitats to other plants – very aggressive weedy plants that take over and crowd out the native plants. Those weedy plants are usually alien plants brought to this country from overseas. Examples are purple loosestrife, brome grass and even some shrubs. We don’t usually think of shrubs as weeds, but certain ones are, such as common buckthorn, autumn olive and bush honeysuckle. So what do people do when they restore native landscapes? The majority of the work is weeding out the plants that have invaded the area. Some alien plants are pulled out before they set seeds. Some are cut. but if common buckthorn is just cut, it will send up new shoots producing more buckthorn than before, so the stumps of the cut shrub must be treated with herbicide to kill all the roots. The herbicide is “painted” on, not sprayed, with a special sponge tip applicator. This puts the herbicide only where it is needed. With certain herbicides this method can even be used in wetlands. Restoring native landscapes is a fairly new science, so this conference was very useful in sharing the details of methods that work the best. The people attending ranged from scientists and biologists and botanists to regular people that volunteer their time doing the labor. I’ll write you more next time about the speakers and classes at the conference, places that have been restored and plants that have saved. For years I have been looking for a way to keep my feet dry in the greenhouse and garden. 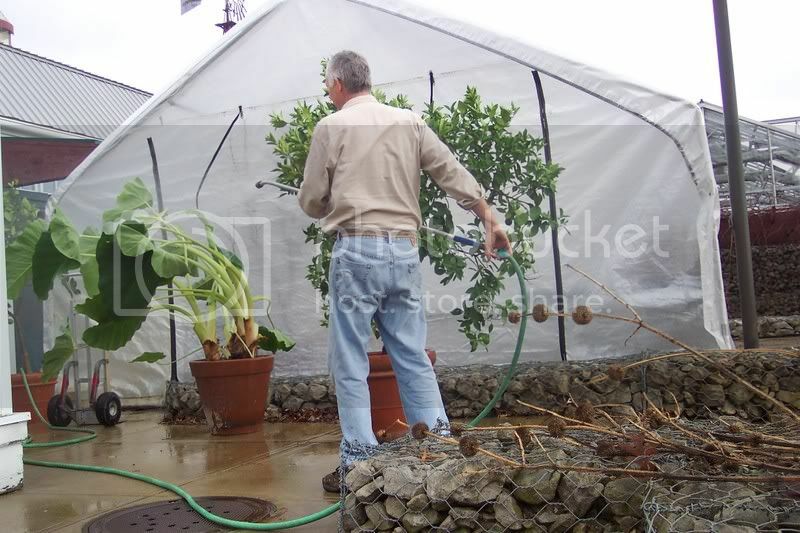 A lot of water gets sloshed around in the greenhouse and my feet often get wet and stay wet all day. The same is true out in the garden on a morning covered with heavy dew . 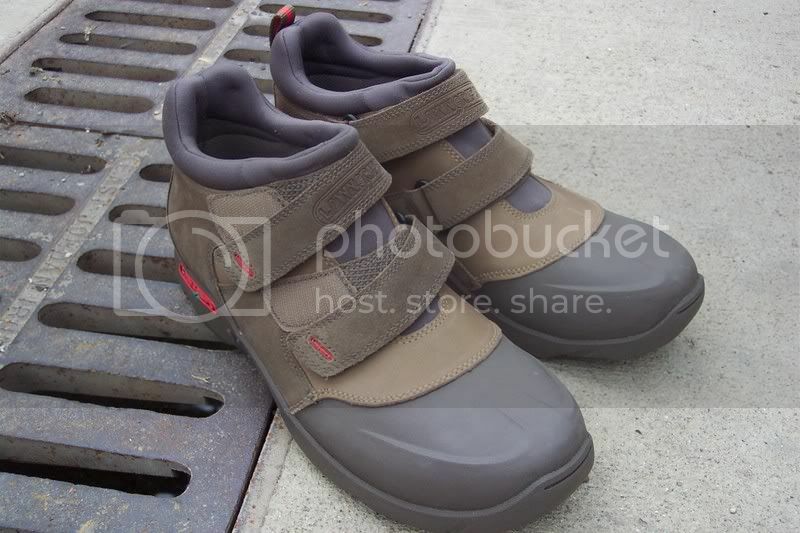 I’ve tried slip-on boots, the type that go over your shoes… they are too heavy to wear all day. Galoshes are out of the question, for the same reason. Disposable over boots are OK, but the don’t hold up to a lot of walking. Wellington’s (known as “Wellies” in The British Isles) keep my feet the driest, but they are a little heavy and rub against my leg at the top of the boot when I walk. 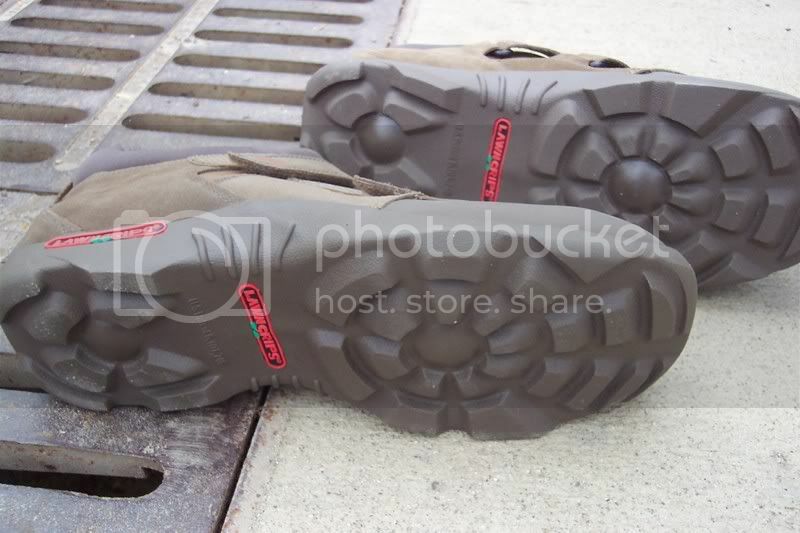 This week the answer to my dilemma arrived via UPS… a pair of “LawnGrips” garden shoes. I opted for the short-top, non-steel toed model. When I first put them on, they felt tight and uncomfortable. I was disappointed because the advertisement claimed that they had a roomy toe area and gave your feet plenty of space. I immediately took them off and planned to send them back. The next day however, I decided to give them another try. Low and behold, after about 15 minutes of walking, the shoe material started to relax and conform to the shape of my foot. They turned out to be a very comfortable shoe, today I even forgot that I had them on. These LawnGrips kept my feet dry in the greenhouse and outdoors in the slushy mess we call snow. The bottom of the shoe has a tread pattern with rounded edges that minimizes the sticking of mud and debris to the bottom. This avoids the biggest complaint I have about hiking boots in the garden…all of those tiny tread spaces tend to pick up and hold mud. Like any product, it is not perfect and has it’s “Archilles heel” :). The top of the shoe has a stretchy porous material where the tongue is located. This allows water to get in if a direct stream of water hits that spot. It’s a minor problem under most conditions. So far I have not needed the put in an extra insole despite walking on the concrete greenhouse floor all day. They are not available in stores yet but can be found at a number of vendors on-line. They set me back about $85 , but if they hold up for the rest of the season, it’ll be well worth it. “…you make lemonade”, the old proverb goes. Does the same principle apply when Bob gives you lemons from the greenhouse? 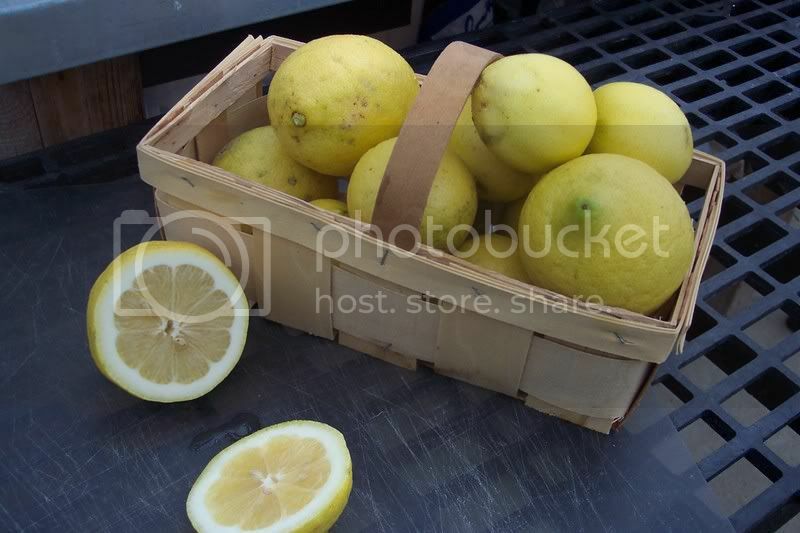 The lemon trees have been providing us with lemons for a couple of weeks now. There are too many for us here to use so the best thing to do is to start giving them away. These lemons are a bit larger than the ones you see in the produce department. They are tastier too. The variety is ‘Beares’ and they seem to be quite happy in the greenhouse. Maybe, a slice of lemon in a cup of hot water will go down better than lemonade on this cold and damp winter’s day. Today was a great day to take out some plants and spray them off. If you have house plants that are infested with pests such as spider mites, mealy bugs or scale, a good rinsing will go a long ways towards cleaning them up. Tomorrow is predicted to be very mild as well, so, take those plants outside where you can spray plenty of water without being concerned about making a mess. The stream of water you use must be strong enough to knock off the bugs but not so strong as to tear or bruise the leaves. 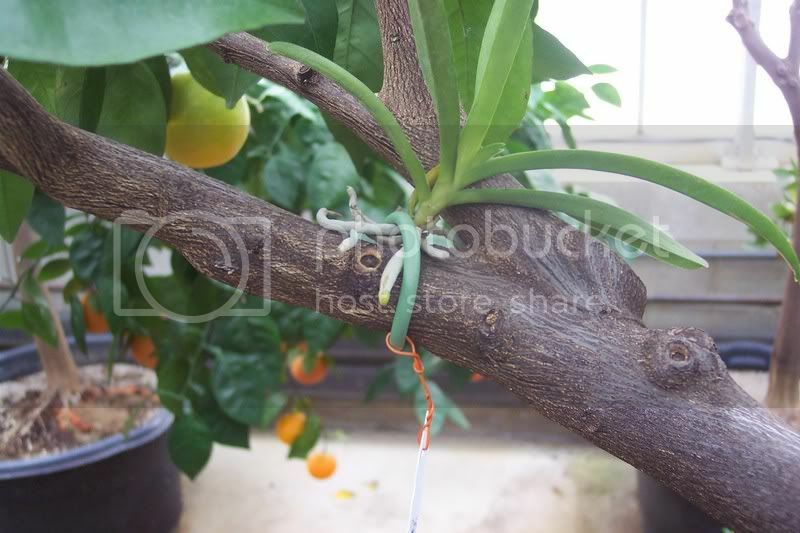 Citrus trees have very tough leaves and seem to be able take quite a bit of pressure. Others plants however, are more delicate. Start with a fine spray and increase the pressure if needed. You’ll have to judge it yourself. I use a 3-hole nozzle that puts out a very fine, yet strong stream of water that knocks off just about everything without damaging leaves. Take advantage of this January thaw while you can. Judy and I traveled to Florida a couple of weeks ago. One of the places we visited was Marie Selby Botanical Gardens in Sarasota. While we were there I bought an Orchid for the greenhouse as a souvenir. Instead of potting it, I decided to put it up onto one of the orange trees. Orchids are epiphytic plants, meaning that their natural habitat is up in the branches of trees. The tree is only supports the plant but doesn’t provide any nourishment for it. I needed a way to firmly attach the orchid without damaging it. 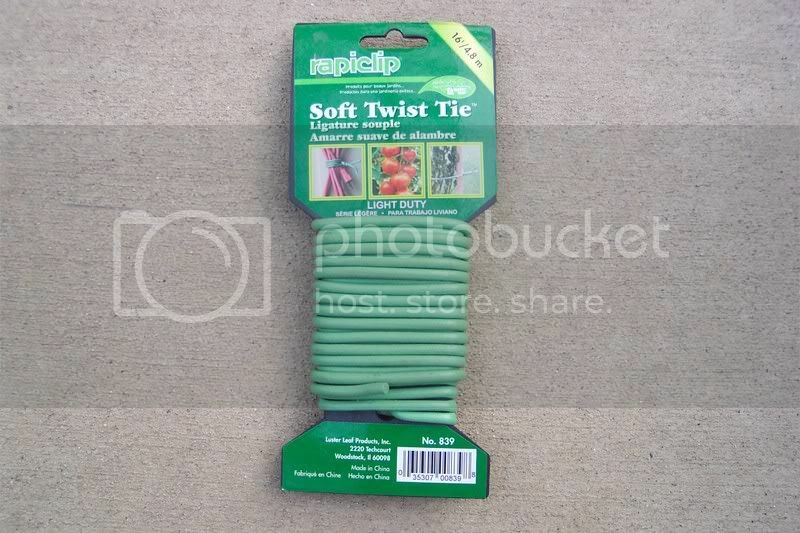 Regular twist ties and Velcro strips first came to mind, but then I remembered something I had acquired in the summer; a roll of Rapiclip Soft Twist Tie. This Twist Tie is a foam rubber coated wire that is very soft and pliable and very easy to work with. I paid five or six dollars for this 16′ roll. You can see here how it gently, yet firmly it holds the orchid to the tree. This spot gets daily misting from the overhead misting system so my souvenir from Florida should be very happy there.